The final action fought on the Mesopotamian Front, the Battle of Sharqat saw British regional Commander-in-Chief Sir William Marshall secure control of the Mosul oilfields north of Baghdad. Activity on the Mesopotamian Front had been muted in the months leading up to the action fought at Sharqat. However Lloyd George's government in London ordered Marshall to remove as much remaining Turkish influence from the region as possible in the weeks immediately prior to the anticipated Turkish armistice, as had earlier been achieved in Palestine. Thus Sir Alexander Cobbe was commanded to lead a combined Anglo-Indian force from Baghdad on 23 October 1918. Its progress was remarkably swift: within two days it had covered 120km, reaching Little Zab River, where it expected to meet and engage the Turkish Sixth Army operating under Ismail Hakki Bey. However Hakki determined to retreat his army once it became clear that Cobbe's force was endangering his army's rear. Retreating therefore to Sharqat a further 100km to the north, he nevertheless came under attack by Cobbe on 29 October 1918. Within a day Hakki surrendered to Cobbe, despite the fact that his lines had yet to be breached by the combined Anglo-Indian force. However with the Ottoman Empire in disarray an armistice was both desirable and imminent, and was consequently agreed within a matter of days. During this last battle in Mesopotamia 18,000 Turk soldiers were taken prisoner by the British, whose losses ran to a little under 2,000 men. Mosul itself was peacefully occupied by an Indian cavalry division two weeks after the Sharqat encounter, falling to the British on 14 November 1918. 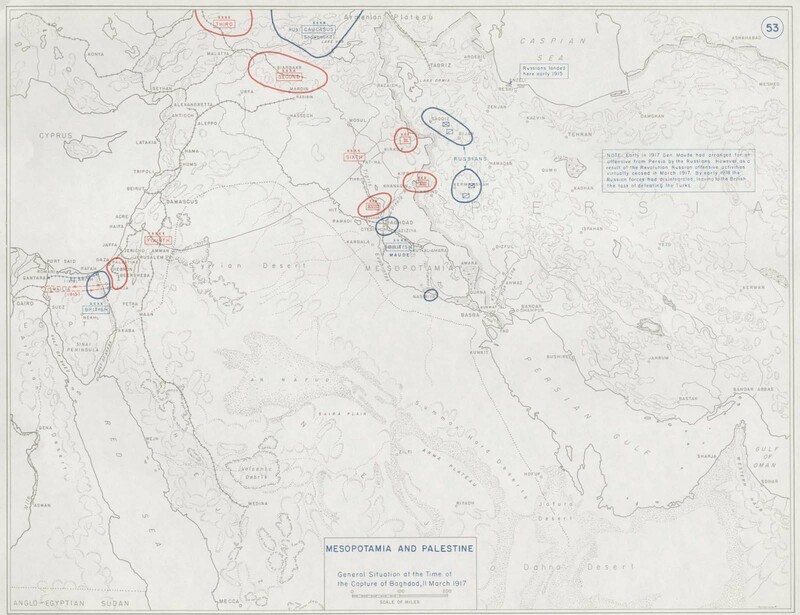 Click here to view a map charting operations at the time of the fall of Baghdad.